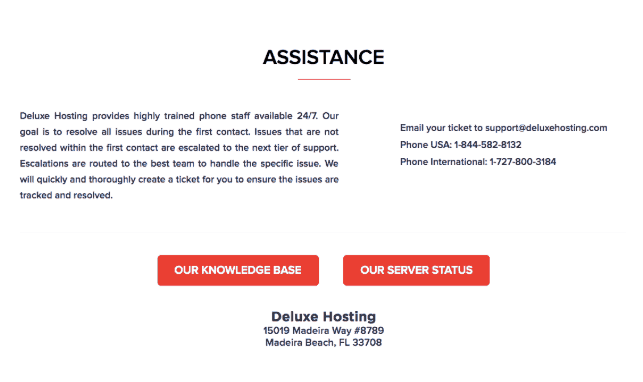 Deluxe Hosting Review 2019: Is Deluxe Hosting a Good Hosting? Deluxe Hosting is a U.S. based provider with a 99.99% uptime guarantee and 24/7 customer service. You will pay a premium for the plans, but this company is owned by a large, well established American corporation. Deluxe Hosting is a U.S. hosting provider with more than 800,000 customers. It’s fair to say, this is a large provider, albeit nowhere near the size of some American giants. Nevertheless, the English language website (the support pages can be translated into multiple languages via a plugin), support, and services are targeted towards business owners who want premium hosting. All of the Deluxe Hosting plans use SSD storage for disk read / write speeds up to ten times faster and an above industry average 99.99% network uptime guarantee (although I can’t see specific details in the terms and conditions). There’s a Softaculous one-click installer for more than 300 programs, which is a premium offering and the control panel is cPanel, which is an easy to use and beginner-friendly control panel. For experts, unusually for shared hosting, the plans come with SSH access, plus all of the usual features e.g., FTP accounts, phpMyAdmin, and SQL databases. It’s less clear whether there’s Cron jobs or support for advanced programming languages, as I wasn’t able to get customer service to confirm either way. The prices are quite high, however, so are the resource allocations, which range from 300GB to 700GB of data transfer and up to 40GB SSD storage. Furthermore, you need to purchase a domain name, SSL certificate, and dedicated IP (if required) separately, so the additional costs are fairly substantial. Plans can be purchased in one month or one year terms with a tiny discount for purchasing the latter. Also, there isn’t a money-back guarantee or free trial, so your best bet to get started is the pricey month-to-month plan. Customer service is 24/7/365 by phone to a U.S. or international number, email, or there’s an average knowledge base on the website you can refer to. There may be more resources in the client only area, however, it requires an existing customer to login, so I can’t confirm. In terms of my experience, I did email the team on a weekday morning and did not get a reply, despite having waited a couple of business days. Deluxe Hosting has a simple website, which is not at all indicative of its parent company, Deluxe, which is large and well established with more than 4.5 million customers. The plans are expensive, but you get a 99.99% uptime guarantee and 24/7 customer service. Wondering how Deluxe Hosting stacks up against other Web Hosting companies? Enter any other Web Hosting company and we will give you a side-by-side comparison.